What Makes Multi-Family Dwelling Compactors Different? The Sani-Tech Systems' Auger Compactors have a unique design that is both efficient and cost effective. With one motion, our compactors crush and compact waste, reducing size five times faster than traditional hydraulic compactors. This means less hauls, less fuel, and more savings. The ST524, ST1040/30, ST1046/36, and the SC1040/30 are the Multi-Family Residence Compactors we recommend for most Apartment complexes, Retirement communities, Condominium neighborhoods, and the like! All Commercial Compactors by Sanitech are a custom build, perhaps your complex has a unique need, you've come to the right place! Sanitech Auger Compactors have high-density bins that handle a steady stream of trash, waste, and recyclables. With a longer and stronger auger shaft and heavier gearbox and bearings, there's nothing these bins can't handle. The Commercial Compactors we offer are designed for Multi-family communities recycling of cardboard and bulky material compacting. 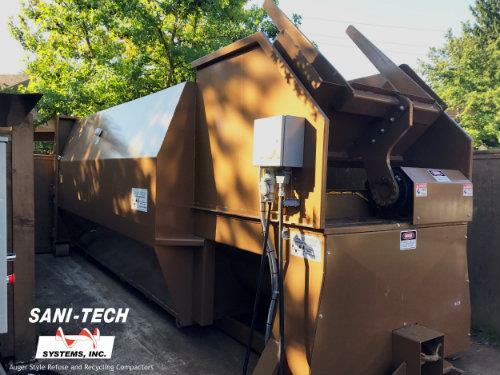 With bin sizes ranging from 15 - 28 feet and a capacity ranging from 4,100 - 7,200 pounds, Sani-Tech System's bins suit any complex's needs. Don't just take our word for it, see what the Emerald Heights Retirement Community had to say about compactors from Sani-Tech. Your community's carbon footprint is reduced when using a Sani-Tech Auger Compactor. Our all-electric rotary drive eliminates the use of hydraulic fluid, along with the risk of contamination, line breaks, leaks and filters. Our all electric approach means your machines produce zero emissions and run quietly. This ensures your tenants, staff, and neighboring residences near the property are not disturbed. Need an Auger Compactor for your rental property? Call us at 800-467-7336 or fill out our contact form. Built 100% in the USA, Sani-Tech is dedicated to providing the highest quality compactors available with the best service possible to our dealers and end users.